We at EFF are worried that today's changes will lead to Facebook users publishing to the world much more information about themselves than they ever intended. It will be interesting to see if there is a mass revolt and people leave Facebook. Here's a social networking application that might be useful to those who want to end it all on Facebook. 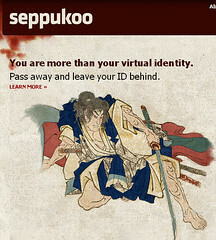 It's called Seppukoo a name that represents the samurai notion of a virtuous death. You know, fall on a sword. Just type in a few final words to share with your Facebook friends and deactivate your Facebook profile. At that point, your friends can continue to write good things about you on a Seppukoo memorial page. Users gain cache on the site if they get their friends to follow their lead. How do you feel about Facebook's new privacy settings? Update: See Lucy Bernholz's piece "Facebook Launches A Foundation. Or Not" Backlash Philanthropy. That's hysterical. What a great find! I should answer the question though: in my opinion Facebook managed to mess up another transition moment in it's ongoing privacy efforts. Instead of explaining how to structure the policy settings to what they were before the change, Facebook privacy defaulted into a much more publicly accessible setting. That in a nutshell is bad business and will invariably drive people away (certainly some in my own circles are considering it). It's a shame that Facebook keeps having these privacy teachable moments and keeps failing to learn from them. I understand people's fear of a lack of "security" when it comes to social networks (and life in general) but ... you know ... life is all about love/trust. The more you put into life, the more you get out of it. I know that might be a bit profound for a conversation about Facebook, but the principle applies. Opening yourself up to the world means better interaction with family, friends and new people. Old acquaintances, long forgotten can re-unite and form strong relationships (My mother is reconnecting with high-school friends.) You could meet a new companion or make a connection that could get you an interview at a new job. So what if your Facebook account get's hacked or some pictures of you are viewed by strangers? God forbid they find out your favorite movies! Anyone serious about stalking you or doing something dangerous is more than likely to find this info out through other means. You have to physically put effort into making your Facebook account dangerous. Don't put your bank account info on your wall. Don't post an image of your credit card for your profile picture. The only thing that might need a bit of explaining is... don't use personal information in your profile that you also use as information for password recoveries for other important accounts like your bank, paypal or world of warcraft. "As is discussed elsewhere on this site, for an identity thief to begin their work, they need very few pieces of information. Once they have found out a person's full name, date of birth, address, telephone number and social security number, there are many low level crimes that can be committed. Store cards can potentially be applied for or other basic identification documents can be applied for." "Low level crimes?" Store cards can "potentially" be applied for? Who puts their social security number on Facebook? I recognize that the FBI has stated that Identity theft is ONE OF the fastest GROWING crimes in America. Though, I wonder how many of those cases resulted from gross negligence, or more than likely, from ardent attackers who wouldn't let Facebook security get in the way? You have to put faith in people. In life, in general, if you go about your day worrying about your security, you're going to have a lousy time. Throwing up barriers is detrimental to your mental health. Trust that (if you're not stupid) the likelihood of being taken advantage of is small and on top of that, the likelihood of recovering from such an event is quite high. Trust people. Trust society. Love. Humanity and the world and life in the 21st century isn't on some downward spiral the sensationalist media would have you believe. (Except for maybe global warming.) It only appears that way because our collective standards have risen. Life is good. Open culture is the way. Facebook is clearly managed by people who know SO little about customer service, it is laughable. Marketing textbooks/classes for YEARS to come will refer to FB examples as case studies! WHAT they do has be come nearly irrelevant. You simply don't continue to PISS OFF your customer base, fail to learn from it...and repeat! The fact that after EVERY major change they make, masses swarm to see who can start the largest "I HATE this ______ change" FB group should be a clue, but alas! It's just all the more ironic to boot that their business is about CONNECTING WITH PEOPLE. Heehee -- great slant on the topic. I actually like Facebook's new privacy settings, but I'm open to points I may be missing. I love how granular the settings are now. Plus, since I had already set up my privacy settings before the transition, they defaulted to a similar setting under the new policy. Basically, I has restricted most of my content to just friends, and that's how it was set under the new policy. What am I missing? but then I went back and looked at all the settings - and I noticed that some things were wide open - like photographs. I went back changed them to only friends. Anyway, always a good reminder to be intentional about what you want to share. 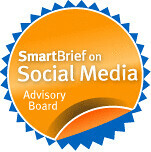 I personally am not a big fan of Facebook or any other mainstream social networking sits, but I still know a little about it. Basically, I think Facebook is a business, a huge money making business, and by changing their privacy settings they are cashing in on people's personal information for revenue. They have taken a huge risk, but its a risk thats worth taking for them.